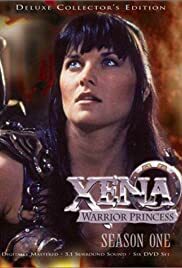 Someone is trying to start a war between the Amazons and the centaurs, which Xena tries to prevent after a dying Amazon princess leaves Gabrielle her right of caste. Xena: Making war is simple. Making peace is never easy. If it was, everyone would do it. No horsing around here. The special effects budget had to be rammed up as they had to create male centaurs. Xena and Gabrielle enter the land of the Amazon nation, female warriors who suddenly come under attack. Terreis, the sister of the Amazon queen is mortally wounded. Gabrielle shields her from further arrows. Before she dies, Terreis gives Gabrielle her Right of Cast that makes her an Amazon princess and responsible for avenging Terreis' death. The Amazons blame the Centaurs for the attack and hold captive the son of the Centaur leader. Xena figures that someone is trying to start a war between the Amazons and the Centaurs. She thinks a warlord will benefit from the impending war between the two races. Gabrielle acquires a staff to aid her walking in this episode, Xena shows her many uses of the staff that includes use of combat. It is a nicely done episode but I noticed that there is already a trend where some third party wants two tribes to go to war for their own personal benefit.